Hi, I am interested in your 1940 Ford Other Ford Models (stock #5114-CHA) listed on Autotrader for $41,995. I'd like to get more information about this vehicle and confirm its availability. 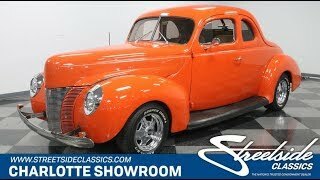 A slick custom exterior, a comfy A/C interior, an overdrive transmission, and a nice small block under the hood thats why this 1940 Ford Business Coupe is the perfect custom classic for all occasions. The business coupe is the ideal place to start when making a custom classic. The long hood and long trunk give it one of the coolest profiles around. The 40s are significant because youre looking at steel from when Henry Ford still had an office at his company. And you can remind people of that as you show how solid this car still is today. But its not just the history that attracts you to this one; its all the upgrades that make it a memorable machine. You see it in areas like the crystal-clear headlights that look like jewelry, shining American Racing five-spoke alloys, blue-dot taillights, and ultra-smooth rear with frenched license plate. Its all wrapped in an attention-grabbing orange. Its nicely detailed with a full-length gray pinstripe that also announces this is a Forty Ford. Inside, you get a full custom package to match the exterior. The gray is now the dominant color, and the orange is used as a cool tuck and roll style insert on the seats and doors. The front seat has a fold-down armrest for individual comfort, and the backs have the kind of modern bolstering to make them all-day comfortable. Speaking of comfort, you also have cold-blowing air conditioning, power locks, cup holders, and an AM/FM/CD stereo. The driver is truly king with a grippy sports steering wheel, tilt column, tall Lokar-style shifter, and upgraded gauges with tach mounted to the side of the column. This motor was made to show off. You have the smooth painted firewall, and theres a ton of shine from the polished air topper, alternator, compressor, pulleys, Edelbrock valve covers, and more. While this is stylish, theres also plenty of substance behind it. This is a 350 cubic-inch motor with upgrades like an Edelbrock four-barrel carburetor, aluminum intake, and shorty headers that feed a rumbling dual exhaust. And more than just upgraded power, when you look at the undercarriage photos, youre going see great enhancements like an upgraded independent front suspension and front disc brakes. Plus, this is a thoughtful driver, thats why you have a four-speed automatic transmission w/highway-friendly overdrive, power steering, and an aluminum radiator w/electric fans to stay cool while youve got the A/C blowing. A standout appearance with all the right upgrades for everyday appeal. A car like this is the perfect anytime classic, but the first step to driving it every day is by calling us today!